How better to launch my blog, than with a recipe of my all-time favorite comfort food, Cornish Pasties. Growing up, my mother made these on special occasions. My birthday is in the summer, but that never kept me from requesting that she make pasties for my special meal. The hot oven heated up the house something awful, but the aroma that filled the air and the meal that lie ahead was well worth it. This really is a great meal for the cold weather, but don’t let it stop you from making it any time of year. Scroll down for a printable version of this recipe. 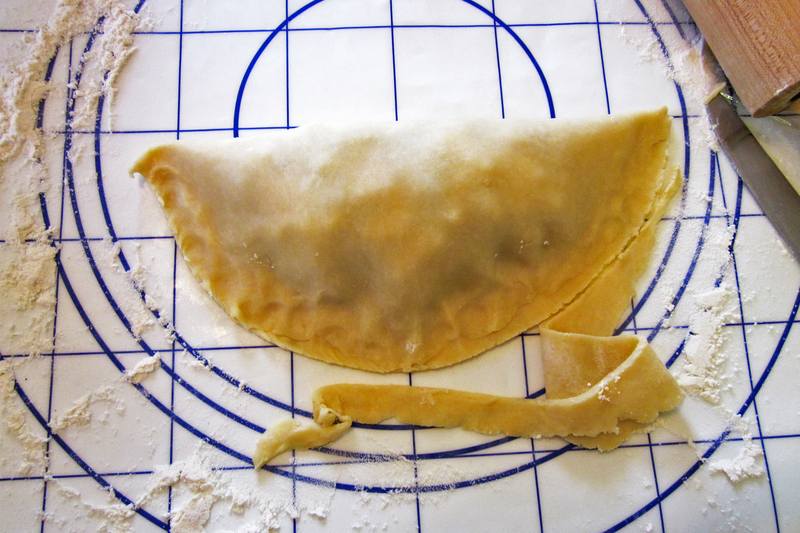 I have included images to aid in the preparation of these perfectly portable pies. 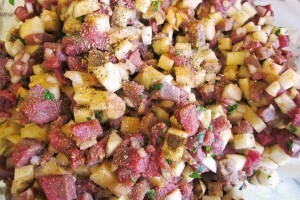 Add wet ingredients to dry, and mix to combine. Do not overwork. *Remember* These can be made ahead, chilled or frozen before use. Classic comfort food. An individual pie filled with beef, potatoes and onion, and packaged in a perfect flaky shell. Serving with Heinz Ketchup is a must! In a large bowl, using a pastry blender, cut together the flour, shortening, butter, sugar and salt, until mostly pea-sized pieces of the shortening and butter remain. In a medium sized bowl, beat together vinegar, egg and water. Pour wet mixture into flour mixture. Mix until just blended, do not overwork. 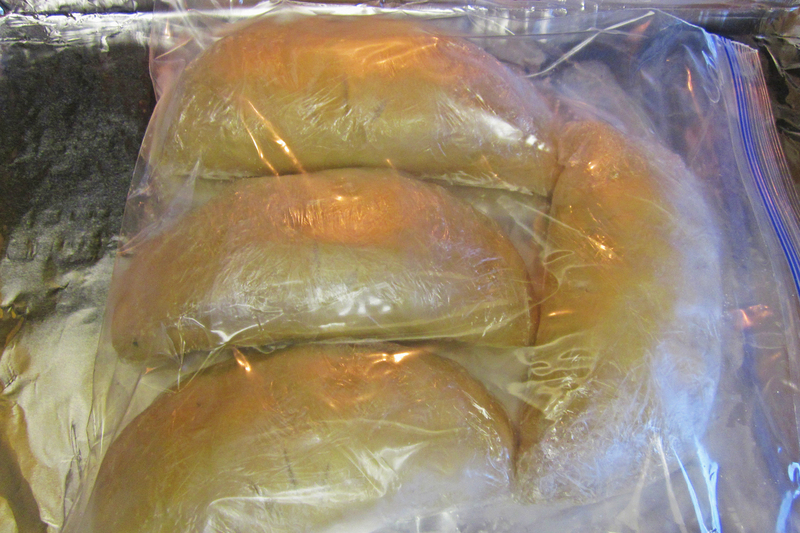 Using your hands, mold dough into a ball, cover with plastic wrap and chill in refrigerator while preparing filling (or at least 20 minutes). Combine steak, potatoes, onion, parsley, seasoned salt and pepper in a large bowl and mix together. 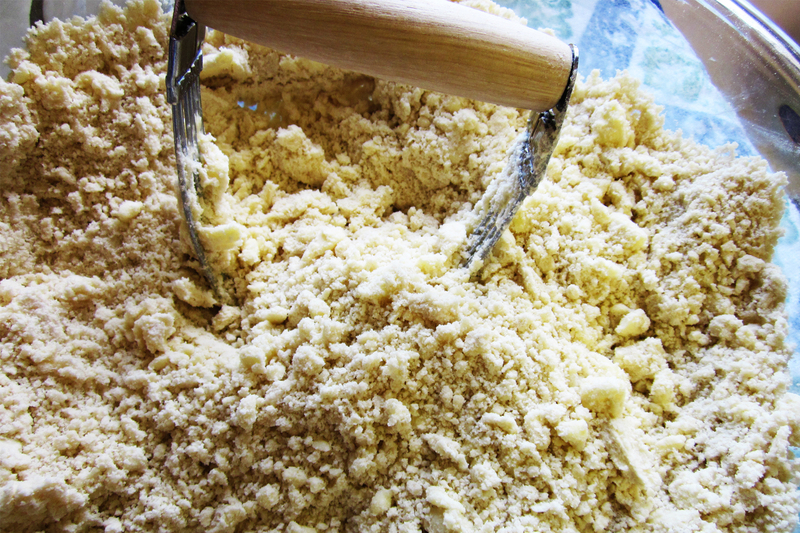 Moderately flour your workspace and rolling pin. 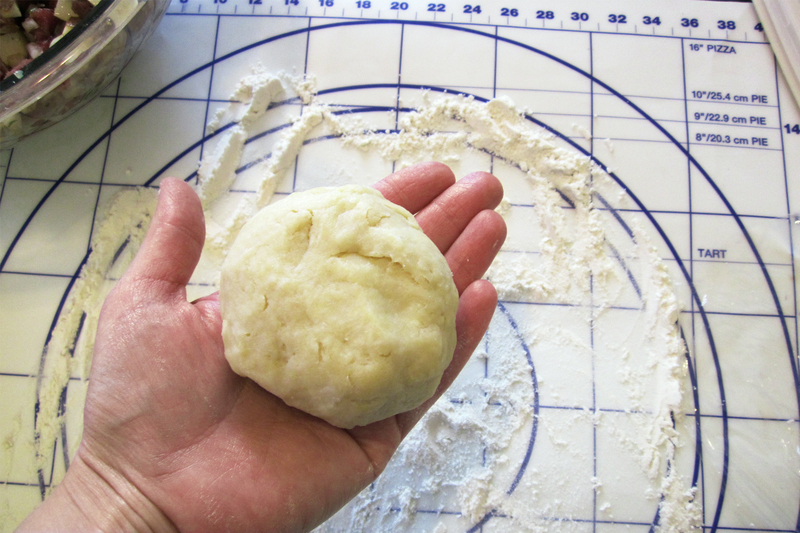 Grab a handful of chilled dough and roll out to about 1/4 inch thickness, and roughly 8" in diameter. Pile filling mixture (roughly 3/4-1 cup) in the lower half of the dough circle. 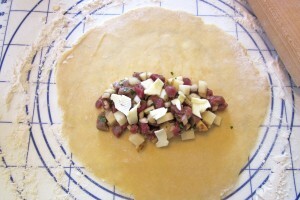 Add a few small pats of butter on top of the filling. 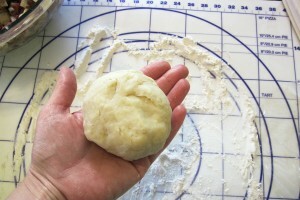 Grabbing the top edge of the dough circle, carefully fold over, and towards yourself, and press against bottom edge to seal. 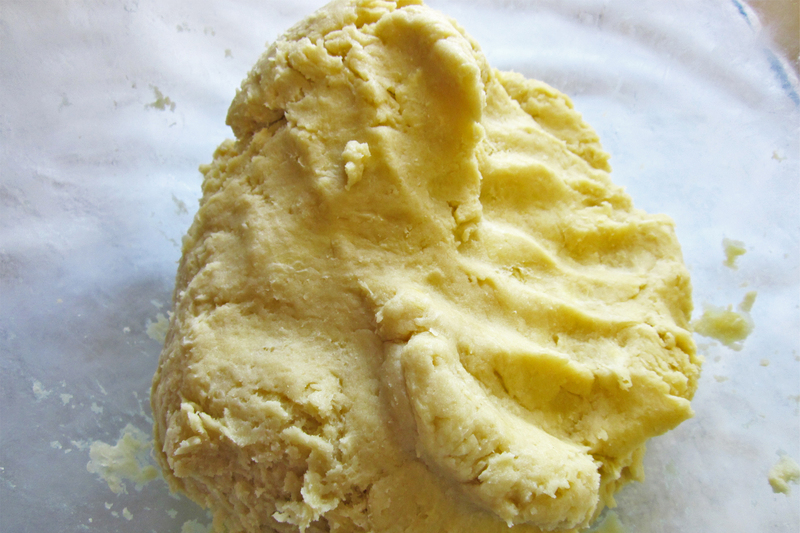 Trim the excess dough and add it back to the ball of unused dough. 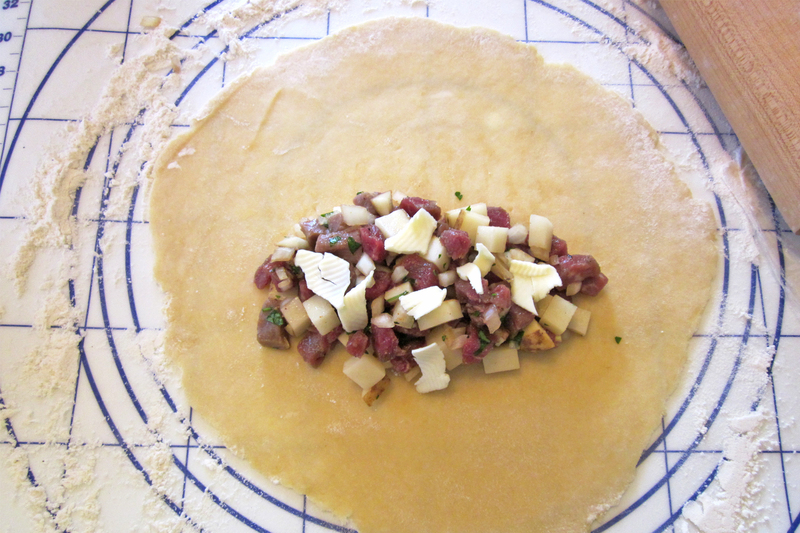 You can chose to roll the edge into a thick rope-like closure, or simply crimp with your fingers or a fork to seal. Cut a small design or someone's initials into the top. 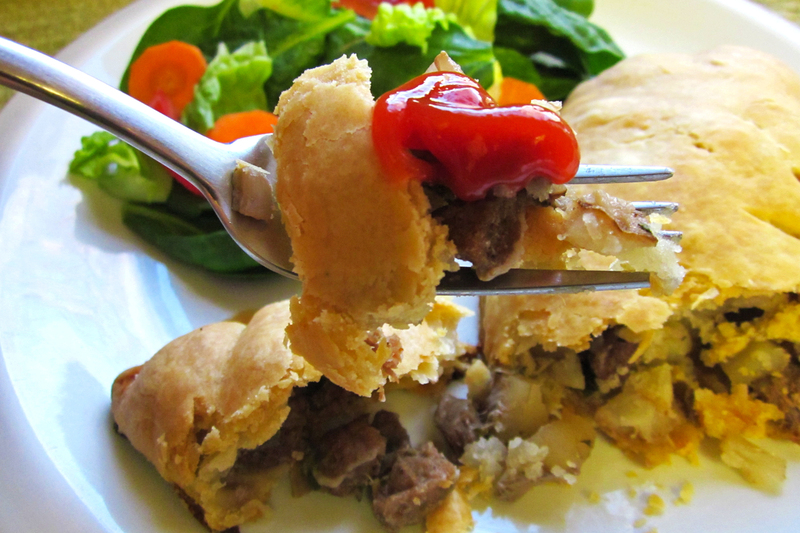 Repeat for each pastie. 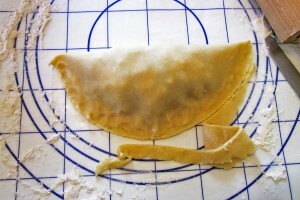 Set oven to 350° F. Lightly spray or line a baking sheet with parchment or tinfoil. Brush each pastie with the egg wash and bake, uncovered at 350° F for 1 hour. It has become tradition to serve, hot out of the oven with liberal amounts of Heinz Ketchup. Enjoy! You can make these ahead of time. 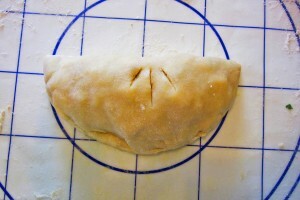 Once pasties have been assembled, they can be placed in the refrigerator for up to 24 hours prior to baking. 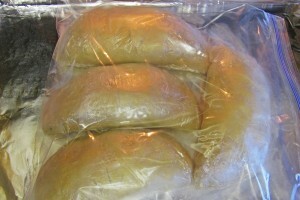 They can also be wrapped in plastic wrap and placed inside freezer bags for months. 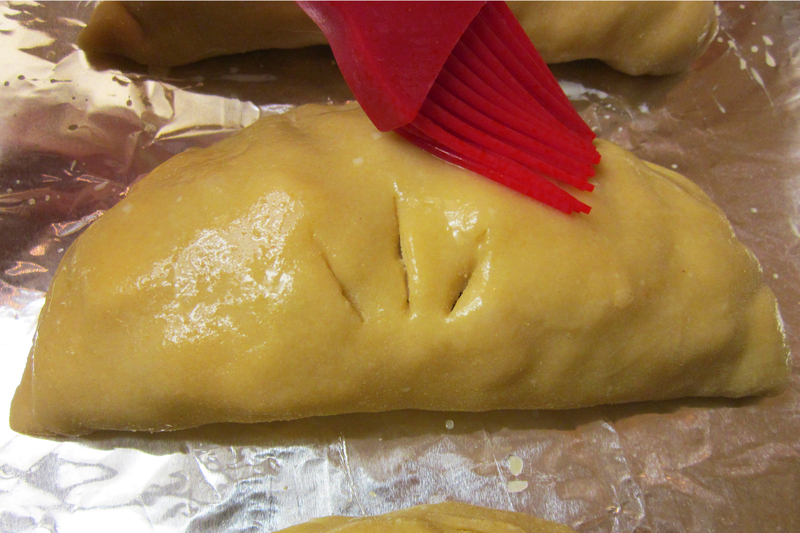 Place cold or frozen pasties on prepared baking sheet, brush each pastie with egg wash and bake, uncovered at 350° F for 1 hour. I love pasties too and can’t wait to try Aunt Ann’s recipe! My mom and I both make these. They are also really popular in my husband’s home state of Michigan. Do you use parsnips or carrots? Do you eat yours with catchup? In what ways does this recipe differ from yours? BTW, Thank you so much for visiting my blog! This recipe is very similar to the one I use. I don’t add the carrots or parsnips, although I think it would be good. I sometimes eat with catsup and sometimes with gravy. My husband likes them with mustard. Hmmm… mustard. That sounds interesting, and good! We use carrots and catsup. 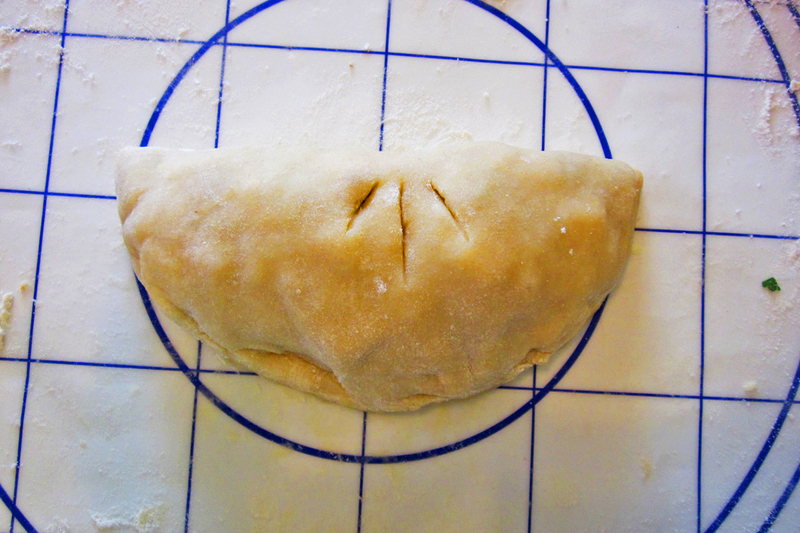 I never had pasties until I became a Rodgers and learned from the best – your Mom. Hi Ginger! I too never had pasties until I married into the Rodgers family! Now I can’t imagine living without them. 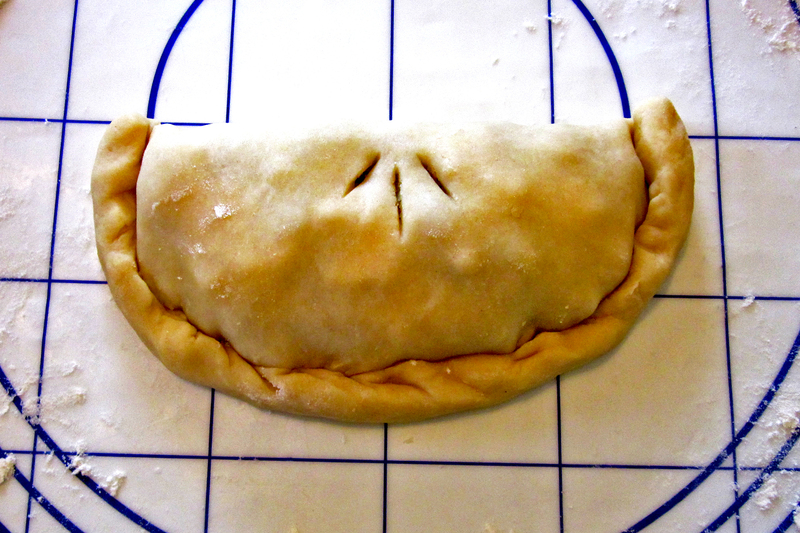 Adam and I have pasty making parties once or twice a year. 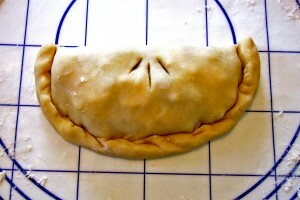 We make around 24-32 pasties at one time. We have some for dinner that night and then freeze the rest. That way I have them to pull out and bake up for a night when I need a no-fuss meal. We always put carrots in, but we tend to eat ours with A-1 Steak Sauce instead of ketchup! Hey Joscelyn! 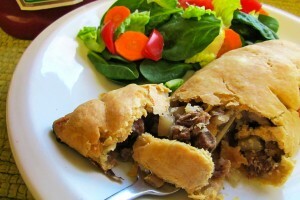 A pasty party… what a great idea! 😀 Closest thing I have done to a party is help two classrooms of fourth graders make them for a California / Gold Rush history lesson. It was a hoot! An odd ingredient in the teacher’s recipe was whipped cream. *what? * Although, they turned out pretty tasty, like they had their own gravy inside. They weren’t half bad. When I make them at home, for the family, I make a large batch and freeze them as well. I agree, a Pasties party sounds fun! I made this recipe over Memorial Day and they were so delicious. I’ve since had them as left overs and have more in the freezer. But note to self – need to make homemade pastry either in cooler weather or when the air conditioning is on!!! Awesome recipe. I still have one more serving left in the freezer, from the batch I made a few months ago. It’s nice to pop them in the toaster oven during the hot weather we have here. It heats up the kitchen considerably less than the big oven.